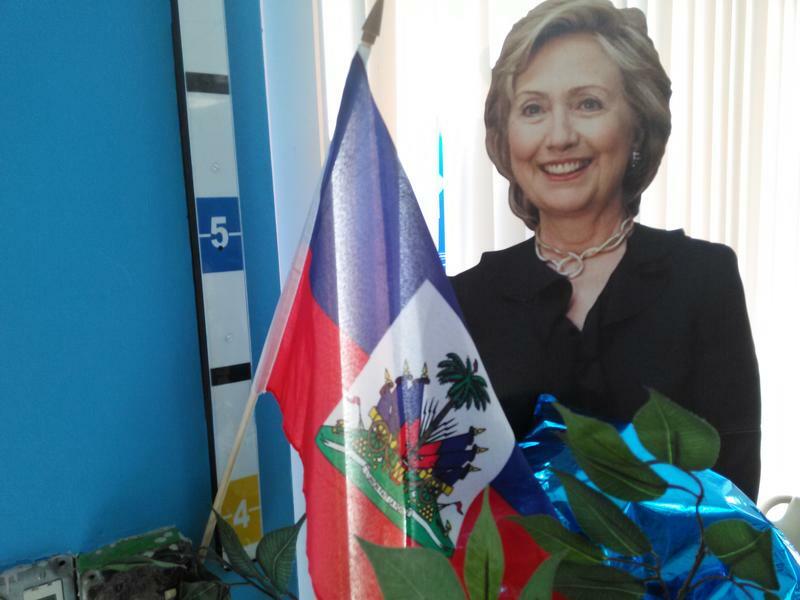 In an effort to court Haitian-American voters, Hillary Clinton opened a campagn office in Little Haiti where voters are welcomed by a cutout of the candidate and a Haitian flag. Along busy Northeast Second Avenue in Miami’s Little Haiti neighborhood sits the Caribbean Marketplace, a bright yellow structure modeled after Haiti’s famous Iron Market. Usually the cultural hub is home to Haitian art exhibits or music-filled nights of konpa and rara. But recently, the complex has been abuzz with political activity – presidential candidate Donald Trump (and protesters) made an appearance and a Hillary Clinton campaign office opened a few doors down. In South Florida, the Haitian community, which largely sways Democratic, is a solid voting bloc, but this presidential election is exposing deep fault lines for the Democratic Party. Clinton’s complicated history in Haiti and a feeling —expressed in other communities— that Democrats take black votes for granted is causing some to question if they'll vote at all. Lutze Segu, 35, a first generation Haitian-American, said this is the first time she's considering sitting out an election. "As a black woman, as a black queer woman, obviously Donald Trump does not speak to me in any way shape or form," she said. And when it comes to Clinton, Segu added, "She's not for me either." Segu said she views her right to vote as a social contract with this country, one she hasn't broken since she registered to vote at 18. Right now, she's undecided. "My parents came here on a raft, on something that I don't think can be considered a boat for me to have a better life." said Segu. " To sit out an election is a big deal for me." For her, Clinton's policies do not go far enough when it comes to addressing the issue of mass incarceration, which disproportionately affects communities of color, and Segu's also critical of the Clinton Foundation's role in Haiti after the 2010 Haiti earthquake. The Clintons have a long and complicated political and humanitarian history in Haiti. Most recently, the Clinton Foundation played a key role in Haiti's recovery efforts after the earthquake. Leslie Voltaire, a former Haitian government official who worked closely with the foundation in Haiti, said Hillary Clinton and the Clinton Foundation have some successes they can point to in Haiti, but it is the missteps and perceived failures that people will cling to. A wide-ranging plan to reinvigorate Haiti's economy by creating jobs was not as successful as initially envisioned and in the process, Haitian contractors were skipped over for American and other foreign firms. Rachelle Salnave, a Miami filmmaker, said she isn't casting a vote for Trump, but Clinton isn't her choice either. Salnave points to Hurricane Matthew which ravaged Haiti leaving over 100,000 homeless and hundreds dead, as another reason she's finding it hard to consider Clinton. "No mention of Haiti and the hurricane," said Salnave. "She doesn't care." On Tuesday, Clinton was campaigning in Miami with Al Gore. Before the rally at Miami-Dade College, in a radio interview with Bishop Victor Curry, Clinton offered her prayers to those affected by Hurricane Matthew including the Haitian people. Salnave was a Bernie Sanders supporter. She's mulling over voting for a third-party candidate. Her father Edouard Salnave, 76, is a fiery Donald Trump supporter. Edouard Salnave said the economy is the primary reason he’s voting for Trump, but when pressed further, his vote is as much a vote against Clinton because of her track record in Haiti. He blames then-Secretary of State Hillary Clinton for paving the way for Haitian singer Michel Martelly to become president of Haiti, a move he said was detrimental to the country and its democracy. “What Mrs. Clinton did in Haiti is disgusting,” he said. The former Democrat of 50 years officially switched his party affiliation to Republican earlier this year. 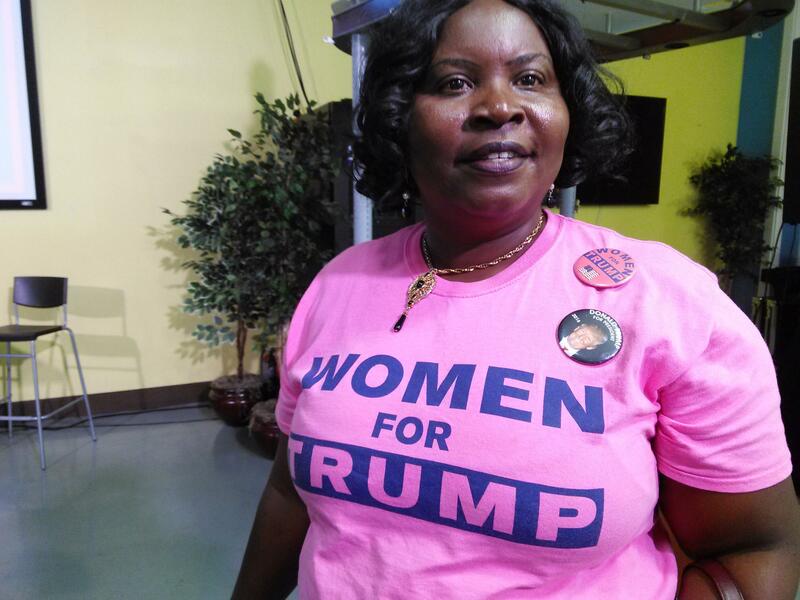 Sara Bernard is a Haitian-American Donald Trump supporter. She said Trump is a strong man who will reinvigorate the economy. Donald Trump sought to capitalize off of Haitian-Americans' frustrations during his September visit to Little Haiti. While reading from prepared statements, he referenced the Haiti earthquake. Sara Bernard, who attended Trump's gathering, got a shout out from the candidate when he told her he liked her pink "Women for Trump" shirt. "I think he'll bring a lot of jobs, he'll keep the country safe," said Bernard. "If the U.S. is secure and people have jobs that's good for Haiti too," she said, referring to more than $1 billion in remittances Haitian-Americans send to Haiti. Trump’s visit to Little Haiti was short and he said very little about how his policies would directly impact or benefit the Haitian-American community. But Guerson Loressaint, a West Palm Beach resident and registered Democrat, said he was impressed Trump showed up. “The Clintons have been running the country for so long and they have not done anything for the Haitian community and I think it’s time to give the baton to Mr. Trump,” he said. “As an immigrant, as a black-American and also as a woman there are some critical issues at play in this election,” said Dotie Joseph, a Clinton surrogate who was born in Haiti. Joseph said the campaign is working on a grassroots effort to connect with Haitian-American communities across Florida and to make the case for Hillary Clinton as president. Clinton’s campaign is also relying on Haitian-American celebrities to push their message. 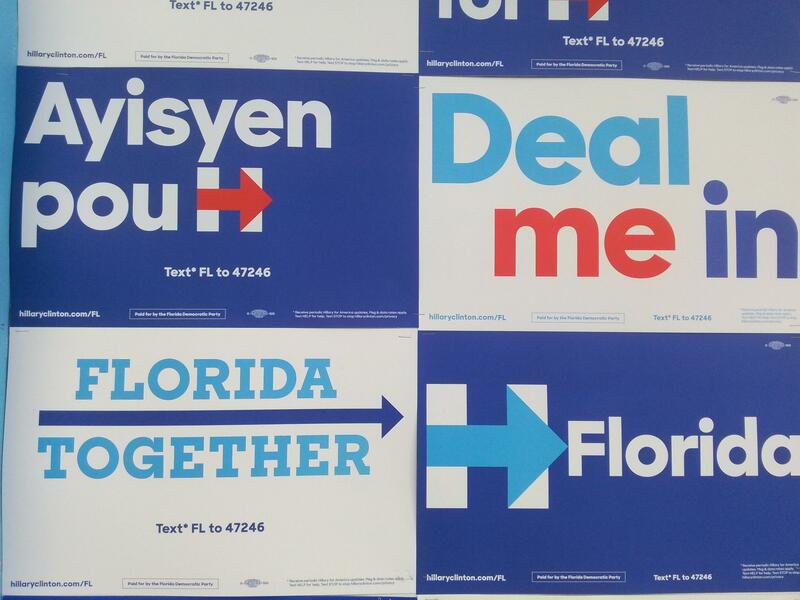 Campaign signs at Hillary Clinton's Little Haiti campaign office. Haitian-American actress Garcelle Beauvais made stops in West Palm Beach to stump for Clinton. Pras Michel, a founding member of the Fugees rap group, visited Little Haiti and other Haitian enclaves encouraging people to register to vote. “You have some people who are motivated and excited and you have some people who are not too motivated,” said Michel. When Barack Obama was running for office, jubilant songs written about the first black president in Creole and French flooded Haitian radio. There are no songs for Hillary Clinton. Joseph said she is wary that about those who might sit out this election altogether because they’re just not excited about either candidate. She’s warning them not do that. “If you don’t vote that’s your business, but the consequence is you’re going to be responsible for that. It’s not just your actions, but also your inaction,” she said. Jacques Despinosse, a former North Miami council member, said for him, Clinton is the obvious choice. Menes, who is working on black immigrant outreach across Florida, said there are a lot of hurt feelings when it comes to Clinton and Haiti, and she has to acknowledge those feelings when trying to convince Haitian-American voters to vote Clinton. “When you don't acknowledge what people are feeling and the frustrations that they're feeling, it's hard to even get towards the why you actually need to vote,” said Menes. She said it’s not an easy sell, but she tries to talk specific policies like immigration. Patrick Muhammed, another Haitian-American voter, said his mind is made up. He said choosing between Trump and Clinton is like being asked "if you want to stick a fork in the top electric socket or the bottom--either way you're going to get shocked," he said. When people ask him, "Are you going to vote?" His response is "Hell no."